I see lots of self-published books. Most are reasonably well edited, but one or two have come to my attention which appear to have been written for school homework and not even marked. One of the worst had an error in the dedication and multiple errors on the first page. That book and, many like it, are not just embarrassing to the author, they give the world of self-publishing a bad reputation that the rest of us have to work twice as hard to shake off. Sorry if that sounds overdramatic. I know a few authors who do a passable job of self-editing although I would never recommend it (few of us are blessed with the ability to see our own mistakes, as a cursory glance over the articles in this website will illustrate!) Many more will pass their manuscript over to a trusted friend or family member who has a talent for spotting mistakes, but by far the best option is to get a professional editor. It need not cost the earth, and is money well spent if you aim to sell beyond your closest circle of friends. There are three broad types of editing as follows. Unfortunately, the terms used and their definitions are not universally agreed on, as a brief serach of the internet will reveal. I am using the following terms and will explain each below. A structural edit or developmental edit will ook at the overall structure of the book. If it is a novel, the editor may suggest removal of entire paragraphs or even chapters, adding new chapters, changing the sequence of chapters, changing the ending, the motivation of the main characters, removal of excessive characters, speeding up the pace by removing description, changing “tell” to “show” etc etc. N.B. We’ve never consciously done this at Blue Poppy Publishing partly because our authors are already pretty good at telling their story, and partly because we don’t work to a formula. That’s not to say we will never go down this route, but I don’t expect to any time soon. What almost always happens, however, is that the author will send their first draft to a few trusted Beta readers who will, sometimes, read it and provide feedback. If the author agrees with the feedback they will make changes, usually before we see the M/S. A line edit is more about checking for things like overall sentence structure, e.g. avoiding run on sentences, clunky grammar, etc. , consistency, e.g. do the heroe’s eyes change colour, or does a supporting character change name part way through the book? The line edit will also correct spellings, grammar, and punctuation as it goes through but this is also considered in more detail at the copy edit stage. or superfluous comma, and missing full-stop is corrected. I say “we hope” because while we aim for perfection, I suspect that typographical errors are a little like bacteria; you can only reduce them to an acceptable level, and never eradicate them completely. As an example, after three passes of editing, and during the formatting stage, I noticed that “St. Pancras Station” in London, had been rendered as “St. Pancreas”! I corrected that, but we still found four or five things that were arguably incorrect after printing. The book concerned currently has 55 reviews and an average 4.4 stars on Amazon, so I think we got away with it. We have used a number of editors in particular Sarah Dawes thankthecat@gmail.com who edits all of my (Oliver’s) books. It is worth noting that Helen works a little differently from most editors usually doing a series of passes for a lower rate per thousand words, and then passing the MS back to the author for approval. This is a very useful way of working for self-published authors on a tight budget because if they feel confident enough in their work that they can get away with only one or two passes of editing, then they may save money. It also allows them to spread out the cost of editing; usually the largest single expense apart from printing, over a period of time. Another lady who has edited and helped to publish other authors, in Ilfracombe and North Devon, is Paula Good at PG Office Services who offers a range of services beyond editing including formatting and print services. It is worth noting that all good editors are ruthlessly efficient, but don’t be afraid. They are on your side! I will add others here as and when. In a perfect world, with unlimited money, you would have three or four separate pairs of eyes, one for each stage of the editing process, but we don’t live in a perfect world, and writers like to eat food just like normal people. You can get a good full editing job done with one editor for around £10+ per thousand words (at the time of writing). Formatting is still partly editing, but is also a separate stage in which the priority is no longer correcting mistakes. This is the part where your raw manuscript, possibly still typed out in double-line spacing and the default font of your word processor, is turned into a beautifully laid out book and exported as a PDF ready for printing. There is a cheap way of doing this which involves pouring your text into a formatting software app and accepting whatever comes out the other side. The better way is to format it properly by human hand and eye. You can learn to do this yourself, or pay someoen like me to do it for you. At the moment I cahrge £1 per 1,000 words, so even if it’s a massive tome of 100k words, you’ll only be forking out a ton. If money is really tight (I know the feeling) then I’ll be writing a “how to format” article soon. Strictly speaking, the term “proofreading” refers to the process of reading the “proof” copy and checking for any last minute errors, in particular any errors which only manifest themselves when the book is printed. This could include abberrant punctuation or spelling errors that somehow got through the entire process of editing, but it is more about making sure the gutter is wide enough, the pages are all actually assembled correctly* and that everything looks as it should before we give the final instruction to the printer to proceed. This is a step which most self-published authors probably miss but if you can take the time at least to check every page and the front and back cover for any last minute inconsistencies then it may save you an expensive mistake on a long print run. *Yes, we once had a consignement of books in which the last 64 pages were in the wrong order – not our error, thank goodness! Author Oliver TooleyPosted on February 28, 2019 April 9, 2019 Categories Uncategorized1 Comment on Some notes on editing a self-published book. A famous quotation goes something like “Everyone has a book in them.” and, although the quote goes on to say, “…and in most cases that’s where it should stay.” we at Blue Poppy Publishing think that there are still a lot of great books, both fiction and non-fiction that could and should be published. 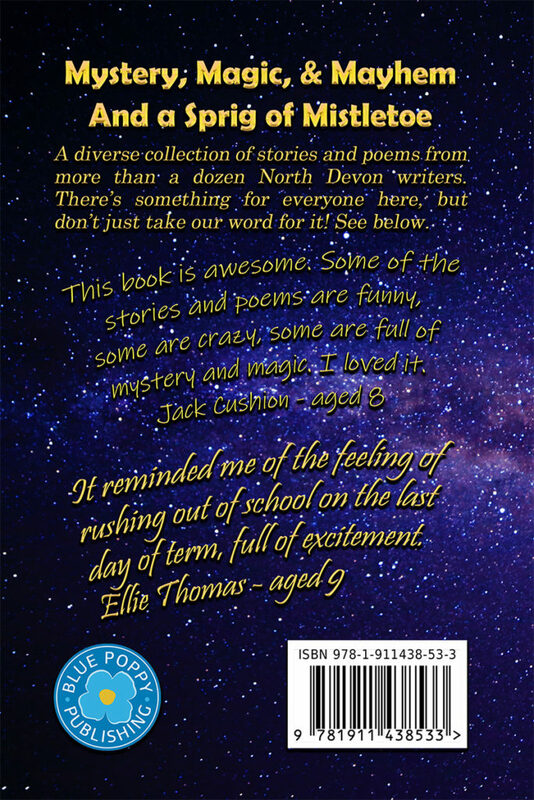 A bit about Blue Poppy Publishing, Devon. I am at great pains to point out that we are not a vanity publisher, but also we are not a traditional publisher either. I guess we are really an “assisted self-publishing” company, suitable for someone who has already decided to self-publish anyway but needs a little extra help. That means that if we publish your book, we don’t buy the rights, or guarantee sales, but we will help with those aspects of self-publishing that you either can’t or won’t do yourself and, while we try to keep costs to a minimum, it will be you paying the bills just as if you did it all yourself. Of course, we do still have to make sure we don’t publish a book that isn’t well written, interesting, original and well produced. Every book that carries the “Blue Poppy Publishing” logo will affect the sales of our other books. If it is good, then readers may want to try our other authors. If it is awful they will never forgive us. Also, we tend only to want to work with authors from our local area, and then again, you might just want to do it all yourself and not involve us at all. So as crazy as it may seem, I’m going to set out some of the things you need to know to self-publish a book in the UK. This will then link to other articles giving you more detail on each area. Anything from nothing to a few thousand pounds is usual. You can publish a book for zero cost, but you should be careful. A great deal depends on what your hopes and aspirations are for your book, but even if you only want to print off a few copies for close friends and family, you should at least take the time to ensure your book has been properly edited, even if that just means re-reading what you have written and trying to correct obvious spelling mistakes. You will also need to format the book and create a cover. If you are good at these things already, or are willing to learn, you may be able to do them yourself, although there is an art to book cover design that arguably extends beyond what can realistically be taught. If you have ambitions to be a professional or semi-professional writer, then you really do need to spend some money to make sure your book is up to scratch. But how much should you spend and who can you trust in a minefield of companies who are out to take your money? We have certain trusted editors, illustrators, cover designers, and printers whom we have used on previous occasions and I will provide their details. We also offer formatting and cover design and preparation in-house, although I make no claim to being a top cover designer I don’t charge much. How long is a piece of string? Well here goes. Basic editing costs, as a rough rule of thumb, £10 per 1,000 words. If your book needs a structural edit and major rewriting then I don’t know because we’ve never done that, all our authors can write a good enough book to start with. For more on editing see here. Formatting is something you can do yourself, but if you don’t want to learn how, we can format a typical digital manuscript in ‘Word’ for £1 per 1,000 words. If your book needs to be formatted using inDesign it will be more and depends on several factors. For cover design, again, most people can do this themselves, but if you can’t or don’t want to, you can spend anything from £10 for a plain one-colour cover with the title and author name, to several thousand pounds on a fancy production from a famous cover designer. We would suggest you don’t spend more than £500 though. The most we ever spent was £600 for artwork. Printing; of course you don’t have to do a print run at all. You can use a Print on Demand (PoD) service, such as Ingram Spark and or Amazon KDP. We like to do a print run if we can though because the unit cost per book works out cheaper; sometimes a lot cheaper. How big should your book be? What type of paper? Which font should you use? These are all questions that plague new self-publishing authors. The problem is there is no single correct answer to any of these type of questions, but there are at least a few possible guidelines you might want to follow. One option is to take a ruler into a bookshop and measure books similar to the one you have written. I did that. I felt stupid. If you are talking about a novel, there is one best size for UK distribution. It’s 198mm x 129mm (we also produce some books in 195 x 125 for cost reasons of which more later) Other sizes can be used, but this is the size of most paperbacks you can buy in bookshops. While on the subject of novels, there is a lot of dispute about how many words constitutes a novel. NaNoWriMo accepts 50,000 words as a full length novel and I’m going to accept that, although a great many novels are from 85-100k words these days. I think that fewer than 50k is a novella, and 10k is a short story. There are a range of sizes in non-fiction which can include the standard novel size, mentioned above. This is ideal for memoirs and narrative non-fiction for example. Other sizes, such as A4, A5, 9″ x 6″, 10″ x 8″ etc. are also common. A lot will depend on things like how and where you expect people to read the book. A coffee table book will want a large format, whereas a pocket guide to cheese will need to be, well, pocket sized. Who you choose to do your printing may also be a factor in your choice. With younger children’s books (3-7+ years) all bets are off. They can be all sorts of sizes. That said, a square format 8″ x 8″ is a good starting point. 8″ x 10″ in either landcape or portrait can also work, as can A4 or A5. Novels for older children (6+ years) will usualy fall into the same category as novels for adults. Rules for children’s non-fiction are equally reflected in those for adults. If you use a PoD publisher like KDP then you don’t get much choice. You can’t print hardback editions either. If you use a printer you have far more parameters. It’s a minefield of options for different pruposes, but the first and biggest coice you have to make is whether to use white paper or cream (or beige or whatever they call it). The choice is realtively simple. I like to use 90gsm instead of the standard 80gsm because a teeny bit mor luxury is worth it for a nicer product feel. Will the customer notice? Not consiciously, no; but subconsciously they will. This begins to fall under formatting, which is a whole separate subject in itself. As a very rough guide, print books for regular readers should use a “serif” font. I use Garamond for adults and young adult books or Century Schoolbook for children’s books, although others, such as Times New Roman, Georgia, or Palatino are just as good. Note that different fonts look larger or smaller than each other for a given size. Of these Garamond is the smallest, which is why I usually use it at 12pt. Century schoolbook is the largest of those shown here, and I tend to use 12pt for older children (8-12) and 14 point for younger readers (6-10). Different serif typefaces shown in size order from smallest, Garamond, to largest Century Schoolbook. The fonts shown are Garamond, Times New Roman, Georgia, Palatino, and Century Schoolbook. For very young children, beginner readers, I prefer to use a simple sans serif font with ‘single story’ A, and G etc. however, following the golden rule of never using ‘Comic Sans’ I searched for alternatives. Please don’t imagine there are any hard and fast rules for children’s books, but I like to try and give them a fighting chance of reading for themselves by using a familiar and fairly regular font which resembles how they are first taught to write. If you want to get creative, do it in the headings. Fonts for reading are clean and simple. It is never a good idea to use any fancy font for the main body text. If you want to use a fancy font on the cover, or in the chapter headings go for it. But even then, don’t go too crazy. Author Oliver TooleyPosted on February 28, 2019 March 1, 2019 Categories Uncategorized2 Comments on How do I Self Publish my book in the UK? Janet Few, author of our bestselling “Barefoot on the Cobbles” writes and talks on history and genealogy travelling all over the world even as far as New Zealand. 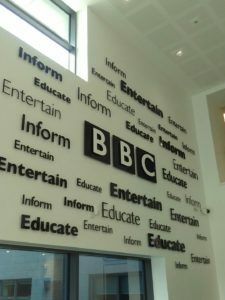 However, in this very personal blog post she covers a different subject, that of her grandson (with his parent’s permission) and his Autism and Passive Demand Avoidance, and the difficulties that can cause when interacting with members of the public who don’t understand the condition. Janet Few’s brilliant historical novel set in Clovelly and surrounding areas at the turn of the 19th century and through the First World War has been going from strength to strength since it’s launch in November of last year. Now it has been given a Chill With A Book – reader’s award as well as gaining several four and five star reviews on major websites. 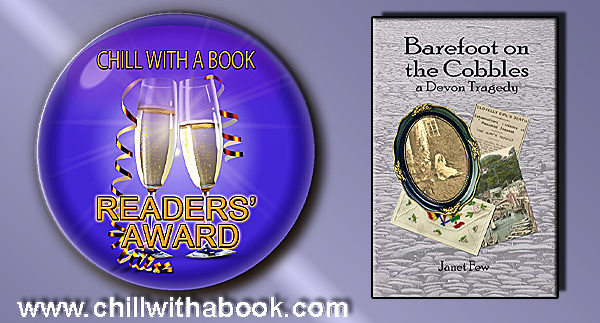 Blue Poppy Publishing wish to congratulate Janet on her well deserved award. Autism is not intrinsically a disability, but the way society is organised makes it so. Downloadable poster to help people understand this. Just a very quick post inspired by an item I saw on Facebook and shared because I agreed with the sentiment. The original post was made by http://autisticnotweird.com/ who of course I give full credit to for putting my own thoughts into good words. One of my characters, Maarten, who appears in “Time Tunnel to West Leighton” and “Time Tunnel to Ironbridge” is autistic. I have created a hi-resolution image because someone I know wanted to make a poster for their classroom, and I’m sharing it below because I couldn’t get it to go through on Facebook uncompressed. The format is A3 300 dpi so should be easy to convert to PDF for printers. I (Oliver Tooley) am autistic although I was never diagnosed. Two of my children are diagnosed and they get help to cope with society as it currently operates. 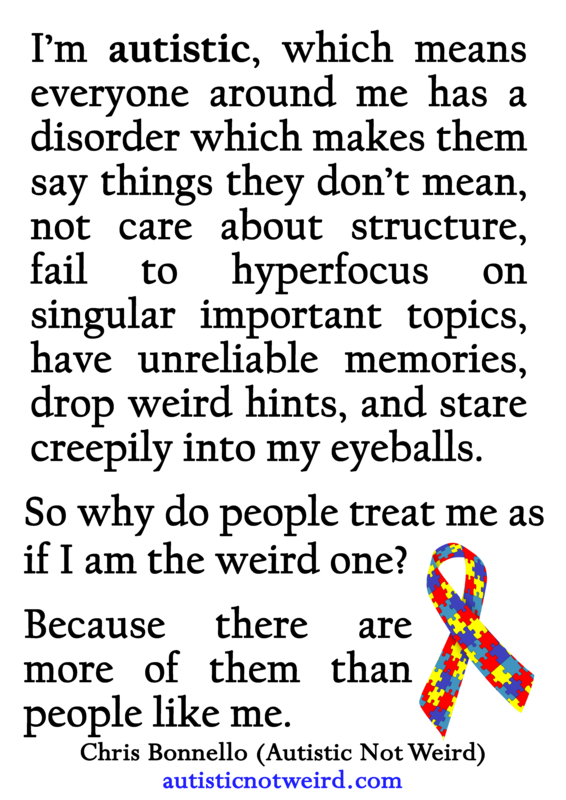 Yet, as the words in this image imply, it’s all those neurotypical people who are weird, not us. I think it’s fair to say this is partly tongue in cheek, but there is a serious note backing it up. You need to click on the image to open it up full size, then right click to save. 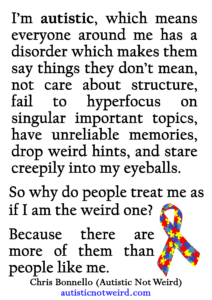 “I’m autistic, which means everyone around me has a disorder which makes them say things they don’t mean, not care about structure, fail to hyperfocus on singular important topics, have unreliable memories, drop weird hints, and stare creepily into my eyeballs. So why do people treat me as the weird one? Author Oliver TooleyPosted on November 21, 2018 November 22, 2018 Categories UncategorizedLeave a comment on Autistic spectrum who’s the weird one? Brand new audio-book available now, FREE Kindle offer coming soon. When Joni Dee approached Blue Poppy Publishing with “And the Wolf Shall Dwell” I was worried that he was based in London. We were, and still are, a small publisher based in North Devon and it is harder to work at a distance, where you can’t pop round with a box of books. Nevertheless, the story is a gripping read and Joni did already have a large number of pre-orders for the paperback and hardcover editions which covered the first print run nicely, so how could we refuse? 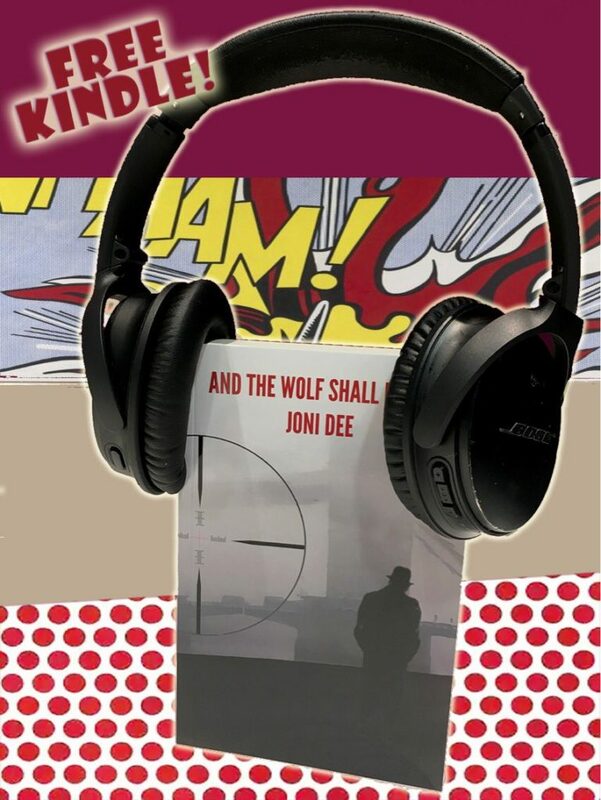 Now Joni has taken the next step on his publishing journey and produced an audio-book version of this stunning contemporary political espionage thriller. You can get it here UK Amazon link or from Amazon in your country, universal link . What was the bit about FREE Kindle? Oh yes, if you haven’t already read “And the Wolf Shall Dwell” and you just want the Kindle edition, you can get it free for a very limited period only, starting on Tuesday 3oth October. Just follow the universal link or do a search on Amazon for “And the Wolf Shall Dwell”, by Joni Dee. Also, if follow Joni Dee on Twitter and RT his tweet about the audio-book then you can be in with a chance to win a free code from Audible. We’re blessed with some wonderful bookshops in North Devon and here at Blue Poppy Publishing, our long term aim is for all books to be sold by retailers, while we only deal with wholesale. For now you can buy our books right here from our website, but if you want to support your local book shop we would love that too, even though we make less money on the deal. 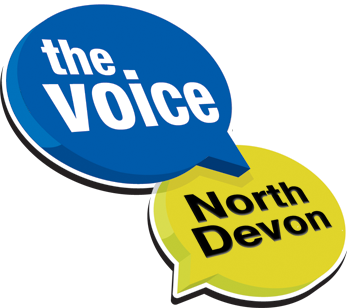 Here’s the lowdown on your local book shops in and around North Devon. This is a wonderful book shop with shelves stacked high with stock and the owner Paul will cheerfully order books for you. As well as books, he stocks a superb range of artists materials, catering for the many amateur and professional artists in the town. There’s no website so if you’re in town pop in and say, ‘Hi’. An unassuming frontage on the one way section of Bear Street in the centre of town opens into a large space crammed with books, although they have more second-hand books they do stock some new, particularly children’s books. Website. Although this shop is almost entirely second-hand and antiquarian books, they do specifically stock books by local authors, including Blue Poppy publications. A beautiful spacious and well stocked bookshop in the centre of Bideford. hey don’t have a website, but there is a Facebook and Twitter account if you want to get in touch. You enter through the Gothic arch of this ancient stone building and find yourself in a large shop spread over two floors with a magnificent spiral staircase. As well as a huge range of stock there is, as you might expect, personal recommendations, and an ordering service which even includes local delivery. As usual, the shop is a community hub with things like a book club and they are a sales outlet for local ticketed events. The website is sparse but is a starting point. Paragon books (not be be confused with Parragon books the publisher) has graced Sidmouth’s shopping scene for over twenty years. With a range of over 5,000 titles, as well as CDs and DVDs, you should find what you want, and if you can’t they can order for you. They also have greetings cards and paintings from local artists. They host author events and sell tickets for other local venues. Find out more on their website. A large bookshop set over three floors, although mostly out of print and previously loved books, they do have some new books of local interest. Website. Set in the centre of historic Newton Abbot; like all Waterstones you’re sure of a professional service and a great range of books with an ordering service, and occasional author events. Website. Another large bookshop over four floors. Book Group meets on the first Thursday of every month (excluding November and December) and there are regular author events. Website. Spread out over three floors with the children’s section on the ground floor, a cafe on the 1st floor and a quiet section on the 2nd floor (sensibly far away from the children. Website. I am writing this at 10:00am on Saturday 29th of September and the brand new book is here and available to buy but ONLY in bookshops or from our shop. If you are coming to Barnstaple Library today from 2:00 – 4:00 pm there will be fun and activities, a chance to meet some of the authors and get them to sign your book. We will get a few extras signed too for those who can’t get there. We would LOVE you to buy the book from your bookshop! Well yes we do, but Blue Poppy Publishing is a publishing company and in the long run we hope that everyone will buy our books in bookshops and we won’t have a retail operation at all. If people order our books from local bookshops there are two major benefits. Bookshops make money which helps the local economy. Bookshops find out we exist and that there is demand for our books. This book is not available on Amazon! You heard! There are technical reasons why, but we decided not to even try to overcome them at least for now. This book is ONLY available from us or from UK bookshops. 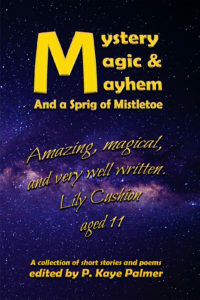 If you want to buy a copy in Birmingham, or Manchester, or Nottingham, or Sheffield, or Aberdeen, or Belfast, or London, just go in and say, “Hello, can you order me a copy of ‘Mystery, Magic, and Mayhem – and a Sprig of Mistletoe’. It’s from Blue Poppy Publishing.” They will look puzzled and then type it into their computer, whereupon you will see their little face light up as they find it. Just in case that doesn’t work for any reason give them the ISBN 978-1-911438-53-3 (you don’t need the hyphens but it’s easier to read that way. They will then order it and take your details to let you know when it arrives. You pay £6 they make a small but certain profit and everyone is happy.